DUAL research projects from the Centre for Crop and Disease Management (CCDM) are shedding new light on ways to combat the damaging disease Sclerotinia stem rot. Researchers from the CCDM – a national research centre co-supported by Curtin University in Western Australia and the Grains Research and Development Corporation (GRDC) – have released new findings from key projects focusing on sclerotinia. It is hoped the results will lead to the development of Australian canola varieties with resistance to sclerotinia, and increase understanding of environmental conditions that cause basal infection, where the disease infects the plant from the bottom of the stem. With no Australian canola varieties showing field resistance to the damaging fungus Sclerotinia sclerotiorum, that causes sclerotinia, CCDM researchers have sourced diverse canola genotypes from around the globe in a bid to discover germplasm with better genetic resistance. Working with researchers from Agriculture and Agri-Food Canada (AAFC), the CCDM team tested how canola plants – that had already shown high levels of resistance to sclerotinia in Canadian tests – would cope if infected with highly aggressive sclerotinia isolates from WA. CCDM researchers collected 71 isolates from around WA, sorted them into genetically diverse groups and selected three highly aggressive isolates to take to the next stage of research. The aggressive isolates were inoculated on a range of plants sourced globally by AAFC from a variety of countries including South Korea, Japan and Pakistan. These plants had already been tested by AAFC’s Lone Buchwaldt, who found they were partially resistant to Canadian sclerotinia isolates. “We wanted to know if the Canadian-tested lines would stand up against the most aggressive WA isolates we could find and the great news is that they did,” said researcher Matthew Denton-Giles, formerly with CCDM. “The Australian trials closely mirrored the results from previous Canadian trials and this is positive news given the aggressive nature of the Australian sclerotinia isolates. CCDM co-director, Professor Mark Gibberd, said the research would help develop sclerotinia-resistant canola in Australia. “The next step is to collaborate with both AAFC and Australian breeding teams to develop canola populations that contain this resistance,” Professor Gibberd said. The research is outlined in the paper – Partial stem resistance in Brassica napus to highly aggressive and genetically diverse Sclerotinia sclerotiorum isolates from Australia – that has just been published in the Canadian Journal of Plant Pathology and is available at http://bit.ly/2Nng9ky. CCDM researchers have also investigated environmental factors leading to basal infection of canola. To determine which growing conditions will increase the risk of basal infection, former CCDM honours student David Lane carried out laboratory-based tests on hundreds of sclerotia (hard, black irregular shaped and rounded bodies from advanced sclerotinia infections) from WA. Results showed that sclerotia subjected to dry and hot conditions (37ºC), and then exposed to moist conditions, were more likely to germinate and produce hyphae (filaments of a fungus) that could infect plant tissue. According to Dr Denton-Giles, who supervised the research, these conditions mirror the climate conditions faced by most growers in Australia’s western and southern cropping regions – with hot and dry summer conditions followed by autumn rains. 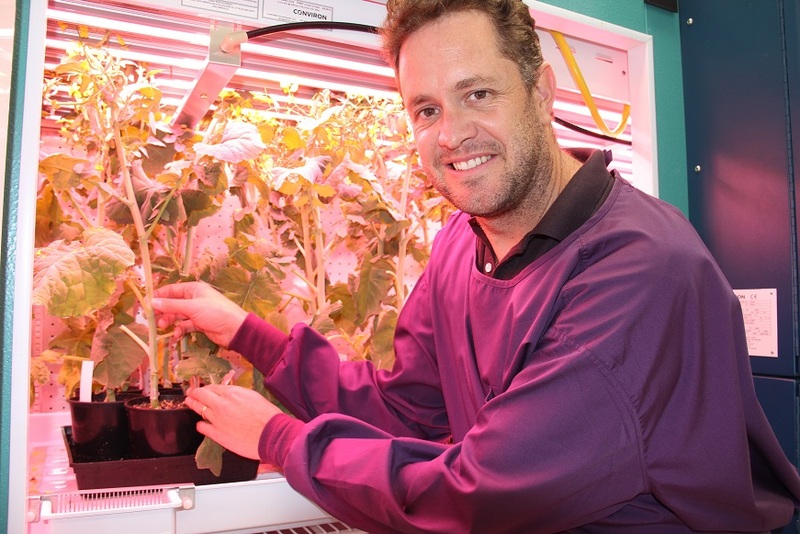 “This latest research provides scientific confirmation of what many of us have long suspected about growing conditions that favour basal infection of canola plants,” Dr Denton-Giles said. This research – ‘Heat-Dried sclerotia of Sclerotinia sclerotiorum myceliogenically germinate in water and are able to infect Brassica napus’ – has been published in Crop & Pasture Science, with the full paper available at http://bit.ly/2MPorMS.